The Samsung Galaxy S4 is the biggest Android launch of 2013, bar none. 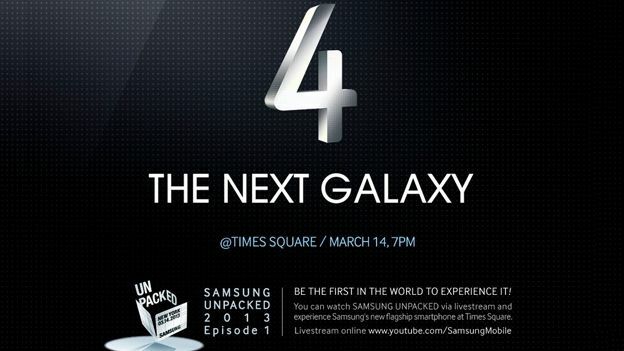 Such is the anticipation surrounding the launch of the next, 'Next Big Thing' that the Korean giant has taken over New York City's Times Square where it'll unleash the handset at a glitzy event on Thursday 14th March. Will the device launch with a 5-inch, full HD screen? Will we see the heavily rumoured octo-core processor take the speed and efficiency of smartphones to the next level? What surprises does Samsung have up its sleeve? Can the company possibly top the blockbusting success of the Galaxy S3 launch last year and deliver another stunning handset? All will be revealed when Samsung takes centre stage at 11PM UK time on Thursday night. We'll be in New York for the launch and will be among the first people in the world to go hands-on with the long-awaited Android handset. We'll also be covering the launch event blow-by-blow right here in our live blog. 00:11: Why was that kid tap-dancing? 00:07: So that was perhaps the most bewildering launch of any product in the history of the world. We're not quite sure what do say. As a smartphone launch it was very, very weird. As a piece of theatre, it was crap. We're going for a bit of a lie down. And a stiff drink. 00:05: http://www.t3.com/features/samsung-galaxy-s4-featuresAnd here's a quick fire feature on the Samsung Galaxy S4 features you should be excited about. 00:01: Here's a nice hands on video with the S4 too, courtesy of T3's own Rhi Morgan. 00:00: We've also got a full hands-on with the Samsung Galaxy S4 live on the site. 23:59: After an absolute clustermess of a launch, which will surely go down as one of the weirdest events in tech history, we'd advise you to head over to our news post for a full run-down of the Samsung Galaxy S4 headline features and specs as well as some official photos. 23:58: And the show has come to a close. It certainly was a unique launch. 23:56: "And I think you girls are done" Thank the good lord for that. 23:56: The ladies are now playing with a new case that allows users to view notifications on the screen through a gap. The phone knows when the case is closed. 23:56: S Health now and the same really, really, really annoying ladies are still on stage. It monitors sleep patterns and eating habits and will tell you how many calories you've burned. 23:54: Smart Pause now being shown. Will automatically pause the video if you look away from the screen. There's also a feature that allows you to browse through a web page by tilting the device. 23:52: Lost a few posts due to a slight technical mishap, but we've just been shown a terrible presentation for the Group Play feature which allows users to play the same song on up 8 devices. It also works with games and photo sharing. It really was a terrible, terrible presentation of what looks like a really cool feature. 23:46: If this seems like it's hard to follow, then that's because it absolutely is. 23:44: It seems this is quite smart when dealing with incoming messages while driving. It'll read your message and ask it you'd like to respond, which you can do with voice to text. You can also answer calls. 23:43: Next Scene: "A day in the life of a New York actor" This is surreal and our segway into S Voice Drive. Text to speech services so you're not distracted. You can answer calls via voice by hooking up with your car's Bluetooth connection. 23:41: Here's an explanation about Samsung HomeSync, the set-top box announced at MWC that'll sync photos back to the device over the cloud and offer 10GB of free storage. "It functions as a hub for your life and memories." 23:40: You can also get photos printed into a photo book. 23:39: It's starting to get pretty weird up in here. In this scene Weird Jeff is obsessed with his lady Weird Anna and has lots of photos of her of him on his phone that he's turning into Album Stories. 23:38: Story Album feature turns photos into albums. If you take photos in the same environment on the same date, you can create a Story Album. It knows when you're travelling too. 23:37: Adapt Display adjusts contrast and brightness depending on your environment. "It makes whatever you're looking at look better and easier on your eyes. It's the optimum viewing experience." 23:36: It can also translate books and menus. It's integrated into email, ChatOn and messaging apps. 23:35: Next scene: "John is trying to find his way around Shanghai, but doesn't speak Chinese" And that's our segway into the S Translator feature. It's basically a version of Google Translate build directly into the Galaxy S4. Type in English and it speaks it into a 9 launguages and will translate the response back to English. 23:34: Here's the first demonstration of Air View. Like the Note 2 with the S-Pen, you can hover your finger over an album to see the photos within it. 23:33: Drama Shot allows users to take 100 shots in 4 seconds. There's also a feature called Eraser which can erase "people or unnecessary objects" which effectively kills Photobombing forever. Spoiled sports. 23:33: So Jeremy can tap dance. Really, really well. Who'd have thunk it? This is the best smartphone launch ever. Never let it be said that Samsung copies Apple, ever, ever, EVER again. 23:33: Dual camera also works with still photos. Sound & Shot feature allows users to record 9 second of audio alongside every photograph. "Adds another dimension of detail to the visual memory you've created." 23:32: So we have an elementary school theme here with Jeremy yet again. They're using this to announce Dual Camera. You can shoot video with box cameras at the same time. You can capture the scene you're looking at and place yourself into it. Great feature. 23:31: "This deserves a unique launch. And I've invited some of Broadway's best known performance." Wow. We DO have a Samsung Galaxy S4 musiclal. You're having a laugh. 23:30: Battery is 2,600mAh. Heeeeough. It's removable too so there's no shortage of power. 23:29: 13mp rear-facing camera, 2mp front-facing camera. 23:27: Will support downloads at 100MBps over 4G and 50MBps uploads. Bluetooth 4.0. IR LED for remote controlling TVs. Samsung WatchOn brings VOD service. 23:26: "So much more alive than ever before. Spent a lot of time connecting the look and feel. 23:25:The Galaxy S4 is only 7.9mm "mind blowingly thin" and weighs 136g. Full HD super AMOLED. 5-inch. 441ppi. New polycarbonate body. It does look super thin too. 23:24: Ryan Biden, marketing bloke for Samsung America is on stage. 23:22: "Once you spend time with the S4, you can feel how its innovations much life richer, simpler and fuller," says Shin as he leaves the stage. Now we've got a video commercial. 23:20: Jeremy is back on stage and the box has been opened! Huge applause for the black and white handsets in Shin's hand. They look exactly the same as the S3, but with a larger screen. 23:19: Looks like this is going to be a very software focused presentation. "It's a life companion for a richer, simpler life. Ladies and gentlement the Samsung Galaxy S4," says Shin. 23:18: Samsung Knox is perfect security solution for using a phone for work and home use. Samsung HomeSync also mentioned. We saw a set-top box launched for this purpose at MWC. 23:16: Running through some big software features early. S Translator, Dual Camera, Air View, Smart Pause, Smart Scroll, Group Play, S Health. We'll see these explained in much more detail throughout the event. 23:15: Samsung has taken tech and innovation forwartd to help us get closer to what matters in life, says Shin. They've listened to us to tell us what a smartphone should provide us in our life. Record sound while taking pictures, with sound and shot. An early reveal of a new feature. 23:13: This Will Chase fella is about as funny as a steel toe-capped boot in the nether-regions. He introduces us to J.K. Shin and we're never been more relieved to see the Samsung Mobile prez. 23:12: Will Chase (who?) is the master of ceremonies. The kid, Jeremy, won't show him what's in the box. Run, Jeremy Run!! 23:11: Alright now after showing his commercial, that Richie Rich kid from the commercial is on stage at Radio City. We're ready for the show! 23:09: So, ten minutes after it was scheduled, the Samsung harpy theme kicks in and it looks like we're good to go. Steve Jobs never kept us waiting on days like this. Always on time was our Steve. And dressed in a black turtleneck. 23:07: Rhi Morgan, who's live at the event in New York says: "Big woops as the tanoy comes on and says the event will start in a few minutes. It's absolutely packed, 3000 people packed into the halls. Who needs The Beatles when you have the S4? There's more Samsung Galaxy cameras than I can count too." 23:05: Did anyone else see that PS4 launch the other week? Went on a bit, didn't it? Be great if Samsung cut to the chase tonight wouldn't it? We want features and we want them now. 23:04: In fact this may be, one big musical theatre ensemble. 23:02: If Samsung kicks this off with some sort of smarthphone-themed musical theatre ensemble, then we're not going to be happy. 23:01: Buh, buh, buh, buduh-duhhhh. 23:00: "Ladies and gentlemen, places for the top of the show." How very Broadway. 22:55: Five minutes to go. Y'all got your popcorn a poppin'? 22:54: What kind of camera tech can we expect to see on the Galaxy S4? The rumour mill has locked in a 13-megapixel offering, but we're expecting some great new software additions beyond those extra megapixels. 22:51: As well as learning all about the device, we're also pretty keen to find out when the device will be going on sale in the UK. Samsung didn't waste much time getting the S3 into the hands of consumers last year. Can we expect an S4 release date within a month? 22:50: Ten minutes. Just ten minutes until go time. 22:48: T3's Rhi Morgan is seated at the Radio City Music Hall and will be bringing us the first hands-on with the long awaited Galaxy S4 at the conclusion of the event. 22:45: We're excited to see what auxiliary software has Samsung conjured up in the last year to sit on top of Android? There have been plentiful rumours of Air View tech that would allow certain aspects of the phone to be controlled without touching the device, while the many leaks have also prefaced the possibility of Smart Pause tech, which would pause a video as soon as the user looks away. 22:37: Which features are you most hoping to see in the Galaxy S4? Do you think the inclusion of an octo-core processor could make a huge difference to the speed and efficiency of the handset? Will Samsung join the rest of the 5-inch full HD brigade? 22:34: We're but 25 minutes away from perhaps the most important mobile handset launch of 2013. Reporters are taking their seats at the Radio City Music Hall in Historic Times Square, New York.